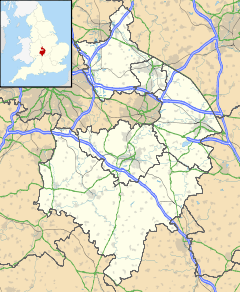 Stretton-under-Fosse is a village and civil parish in the English county of Warwickshire. In 2001 its population was recorded as 185, increasing to 234 at the 2011 Census. The village contains a number of old cottages along its main street. Just outside Stretton is an old manor house, Newbold Revel, which is now used as a training college for prison officers. Nearby is the Oxford Canal and a canal arm leading to Stretton Wharf. Confusingly, another village in Warwickshire, Stretton-on-Fosse, has a very similar name. The latter is located at the other end of the county. Stretton means "settlement on a Roman Road" (from the Old English stræt and tun). In this case the road is Fosse Way. ^ "Civil Parish population 2011". Retrieved 1 January 2016.